Jewellery is a women’s best friend. Being a woman, I know there is so much truth behind this phrase. It is really hard to tell when a woman would fall in love with jewellery. 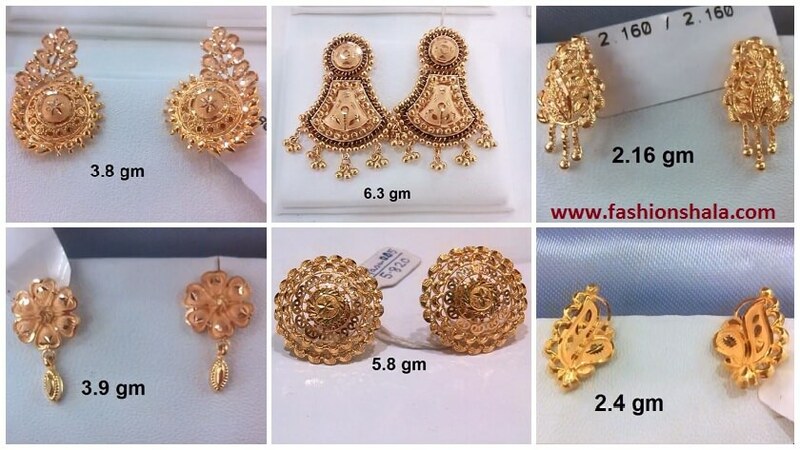 Even if we don’t want to wear all those heavy and excessive jewellery pieces, an earring is a must have. It can make even the most boring of your outfit a statement piece. “Woman should never go without earrings. 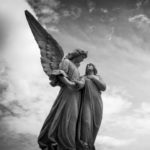 Passing on them is an opportunity missed”. There are many reasons why we love jewellery. It might be because we just love all that bling or just because we want to look pretty. The reason being whatever, accessorising is very important. It really adds an oomph to your entire ensemble. With the onset of a new year, many women have set foot into their new lives as well. 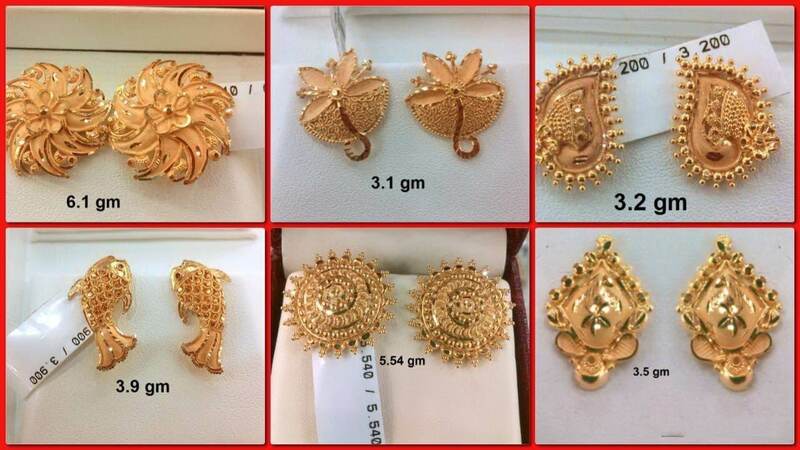 So in this article we will show you some light weight gold stud earrings that you can choose from. Even if you are a bride to be or you want to gift it to any bride, or just want it for yourself, these earrings are perfect. 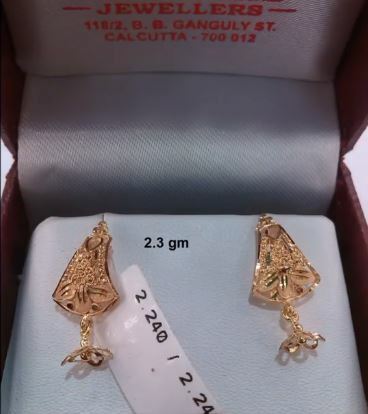 They are light weight, pretty and most importantly they are GOLD! Do we need anything else?? This is very simple and very common design. They are just 2.4 gram so they are super light weight and super pretty. These are perfect if you want to gift it to someone or just want to wear it yourself. Since they are so light you can even use it for a daily bride. 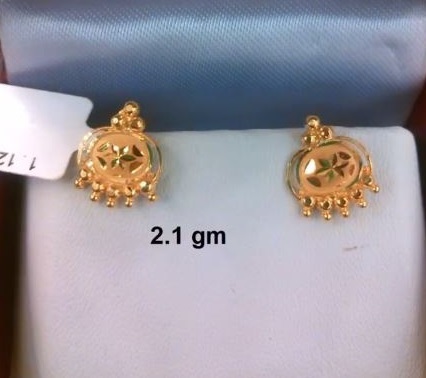 The earring has a solid gold leaf in the middle and a spiral gold cord surrounding it. 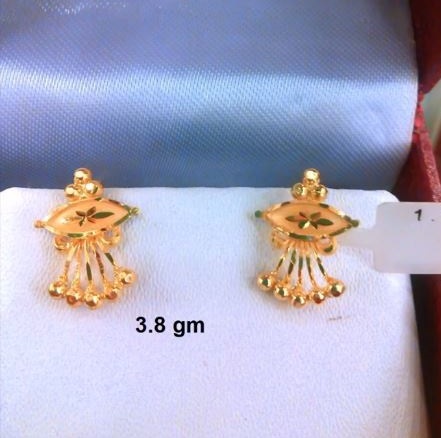 If you are from a family full of ladies, then you must know what a favourite this earring is. 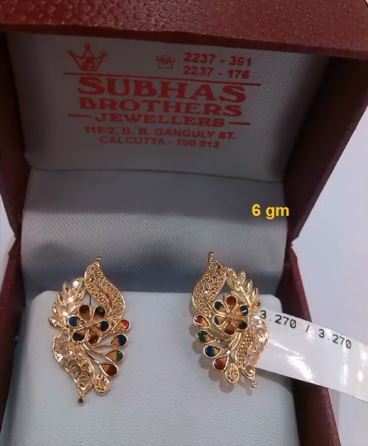 Entirely made of gold, this earring is perfect for those who are not a fan of heavy loaded jewellery. 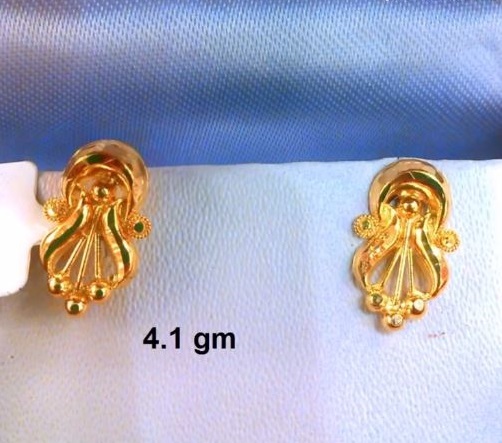 Since this earring is so closely packed, it gives you an appearance of a fuller ear. It makes it look like you are wearing something heavy. But no one has to know that it is just 2.160 grams. The dropped gold cords at the bottom makes it look even more innovative. 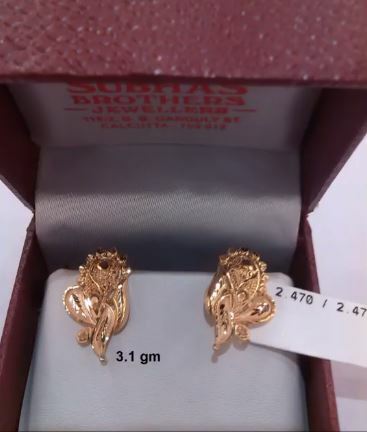 This is one of those earrings which would find a newly wedded wife wearing. This is super simple and convenient for an everyday wear. It is just 2.3 grams, so it is super light weight as well. The solid gold leaf with the square boxes all around gives it an utterly pretty look. This design is so made that it will instantly brighten up your full and tired face. 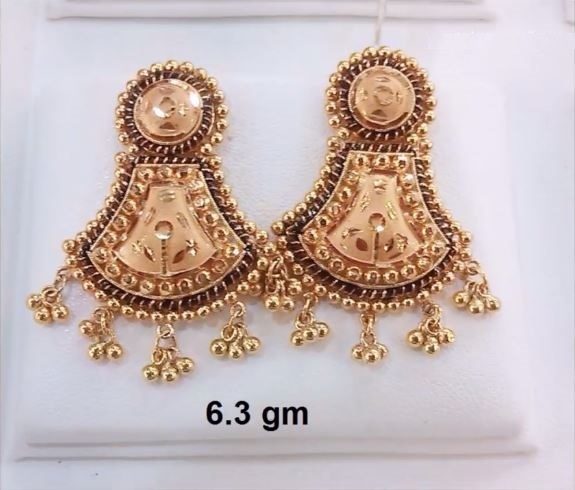 From all bareilly wala jhumkas to the chandelier dangle earrings, these are an utmost favourite of all the ladies all around the world. 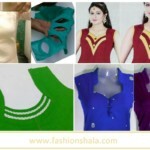 Perfect for a bridal wear, this will add a traditional touch to your overall appearance. The circular top with the geometric drop bottom is a very convenient design. The gold beads all over and at the bottom makes it prettier. It is 6.3 grams so it is perfect for the day long wear. 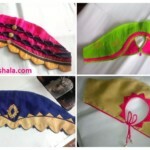 You can even wear this for cultural occasions and festivals. 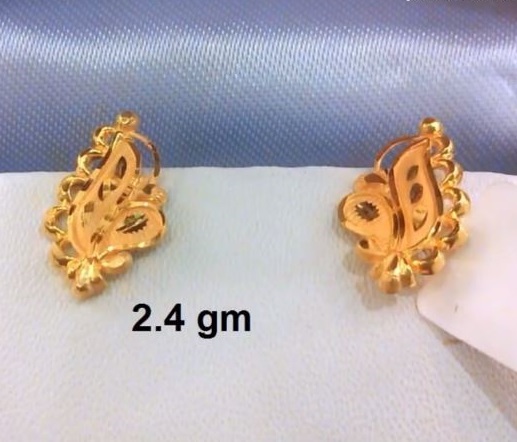 This earring is very pretty and would go with all of your outfits. The multicolour in the shape of a flower in the middle adds to its beauty. 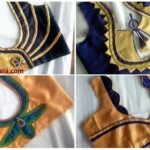 You can wear this with any of your ethnic attires and strut like a stunner. You can even gift it to someone on their special days. This looks like the blazing sun with its rays. Don’t you think so?? The oversized circle with all those embellished and gold beads and drops on all its sides makes it look fiery. This is a very traditional look and the leaves on the top is an add on beauty. 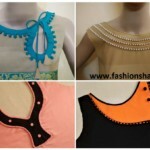 This can make your simple attire a statement piece. This is a super pretty design. 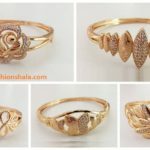 Most favoured by girls who are just starting on jewellery and do not want anything heavy. The flower on the top and the gold drop at the bottom makes it super cute. Since it is only 3.9 grams it is super light as well. You can wear this on a daily basis or for any casual occasion as well. 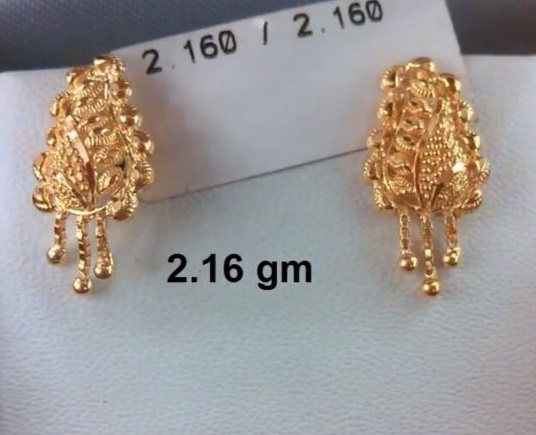 This is every new earrings design. It has a humongous circle in the middle covered with an outer circle. It is designed with three gold beads at the top and a few at the bottom. There is some multicoloured leaves engraved on the circle as well. 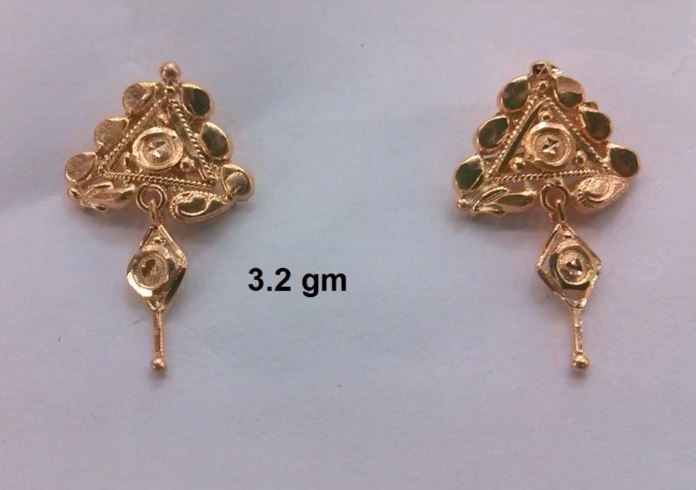 Overall this is a super pretty design keeping in mind that it is only 2.1 grams. This is also a very popular design and if you belong from a Bengali background, you must have seen a lot of this. It has a tapered top shape base with golden tassel hanging at the bottom. Made entirely of gold this looks quite exclusive for just 2.3 grams. This is yet another fancy earring design. Since it is small and pretty it is an utter favourite of young girls. 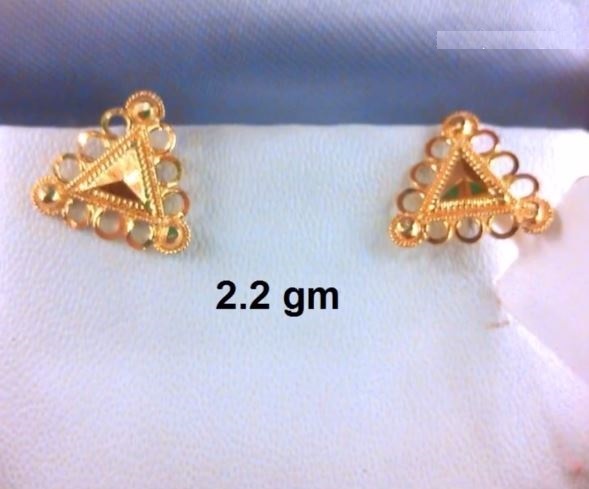 It is shaped in the form of a triangle in the middle which is surrounded by gold hoops. 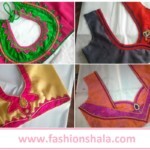 It has also some multicoloured engravings inside the triangle which gives it a very ethnic touch. As it is only 2.2 grams it is perfect for everyday wear. This earring looks like a budding flower. The top in the shape of a flower bud and the golden strands bath the bottom looks like flower anther and filaments. Embedded with green stones it looks super pretty. It might look heavy but it is just 4.1 grams, so you know that it’s not. Perfect for newly weds and any casual occasion. 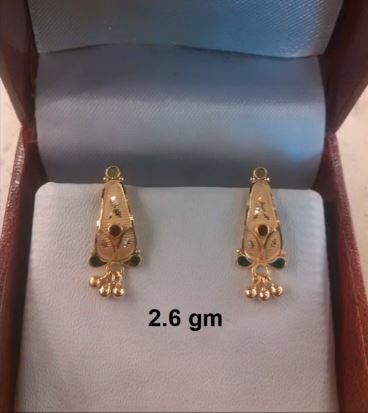 Comprising of a geometric shape, some beads, gold cords dropping and colour engravings, this earring has it all. You cannot ask for more and you cannot ignore this either. The color combination of green and red is an absolute eye catcher. 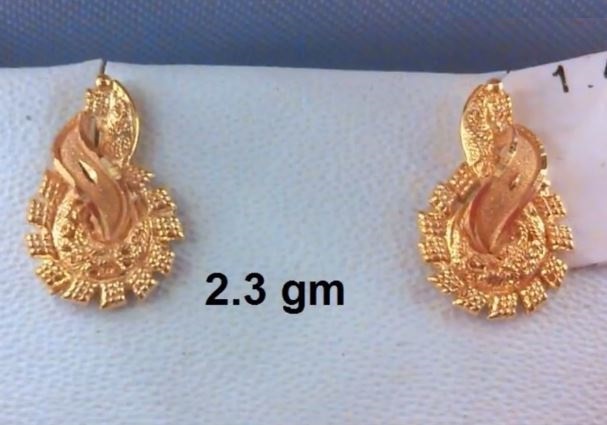 It is only 3.8 grams so you can wear it all day long without any discomfort. This is perfect for gifting as well. This is yet another very conventional and traditional design. 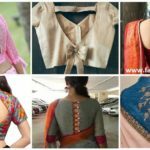 You might have seen many women wearing this, it is that common. And why shouldn’t it be?? The sleek and slim design with golden beads are an absolute stunner. This is perfect for ladies with a short and plump face. This will elongate your face. It is just a.6 grams and the red and green stones makes it even more investment worthy. This is a very complicated design if you look at it, but it is entirely beyond words when you wear it. 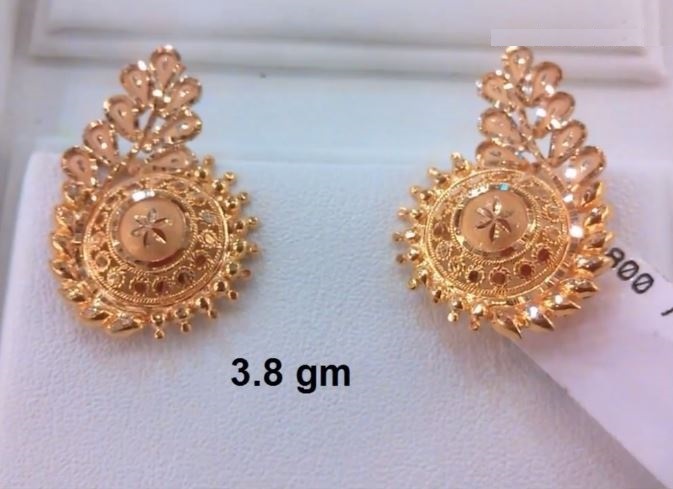 Intricately designed, it is just 3.1 grams and it is super comfortable to wear. You can use this to dazzle up your monochrome and boring outfit. This is a very classy and sophisticated design. I mean just look at it. The decorated triangle, the hanging eyelet gold drop and to top it all the emerald stones. There is nothing not to like about this earring. This can instantly brighten up you day and mood just by looking at it. So just imagine how pretty it would look when you wear it. 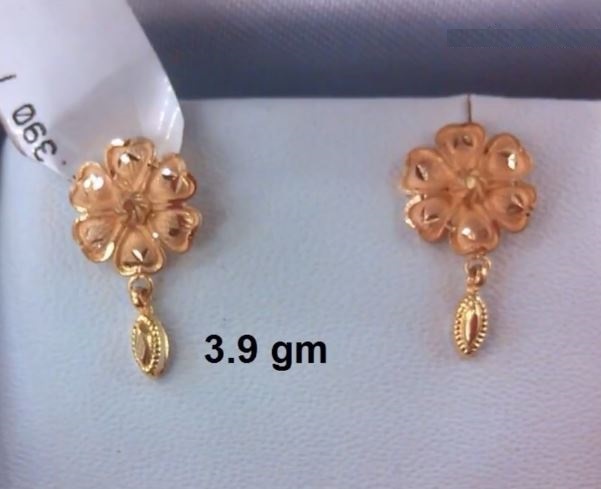 Super light weight with just 3.2 grams, it is perfect for both casual as well as festive occasions. Now that you have browsed through all these pretty designs and secretly made up your mind to get all of them, prepare yourself for any upcoming events. 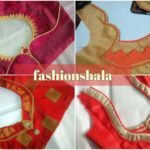 Until next time stay tuned to Fashionshala.